71004 The LEGO Movie Series is a series of Minifigures released in January 2014. It includes characters from The LEGO Movie. This series and 71005 The Simpsons Series are the only Minifigures series that contain minifigures from another theme. Abraham Lincoln and William Shakespeare are the only minifigures that are based on real people with their same names. Taco Tuesday Guy is very similar to Series 2 Maraca Man, and Marsha Queen of the Mermaids strongly resembles the Mermaid from Series 9. It is the first series to have six female characters, having a gender ratio of 3:5. Abraham Lincoln, Marsha Queen of the Mermaids, Panda Guy, Taco Tuesday Guy and William Shakespeare are the only Master Builders in this series. Calamity Drone, Velma Staplebot and Wiley Fusebot are the only representatives of Lord Business's robots in the series. This series has the most Octan elements of all series. Every hair element and colour combination in this series is new, except that of "Where are my Pants?" Guy. This series features two presidents, Abraham Lincoln and President Business. Lincoln is based on the actual U.S. President, while Business is fictional. This is a description taken from LEGO.com. Please do not modify it. (visit this item's product page) 16 all-new, special minifigures from the new THE LEGO® MOVIE™, is now part of the LEGO® Minifigure Collection. Each minifigure comes in a sealed “mystery” bag with one or more accessories, display plate and collector’s booklet. 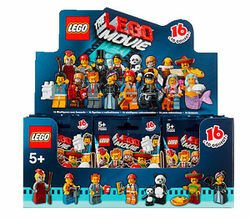 Inspired by The LEGO Movie this collection includes: William Shakespeare, Abraham Lincoln, Panda Guy, Marsha, Queen of the Mermaids, Velma Staplebot, Scribble-Face Bad Cop, Wild West Wyldstyle, Hard Hat Emmet, Gail the Construction Worker, "Where Are My Pants?" Guy, Mrs. Scratchen-Post, Wiley Fusebot, President Business, Calamity Drone, Taco Tuesday Man and Larry the Barista. Every minifigure comes with one or more accessories and a display plate. Fun new characters from THE LEGO® MOVIE™ for your LEGO® Minifigures collection. Facts about "71004 The LEGO Movie Series"
16 all-new, special minifigures from the new THE LEGO® MOVIE™, is now part of the LEGO® Minifigure Collection. Each minifigure comes in a sealed “mystery” bag with one or more accessories, display plate and collector’s booklet. Inspired by The LEGO Movie this collection includes: William Shakespeare, Abraham Lincoln, Panda Guy, Marsha, Queen of the Mermaids, Velma Staplebot, Scribble-Face Bad Cop, Wild West Wyldstyle, Hard Hat Emmet, Gail the Construction Worker, "Where Are My Pants?" Guy, Mrs. Scratchen-Post, Wiley Fusebot, President Business, Calamity Drone, Taco Tuesday Man and Larry the Barista. Every minifigure comes with one or more accessories and a display plate. Fun new characters from THE LEGO® MOVIE™ for your LEGO® Minifigures collection. This page was last edited on 12 July 2016, at 01:45.